Being able to trim your hedge quickly and effortlessly can make life so much better. By using the very best electric hedge trimmer for your needs, you can easily maintain a hedge that looks wonderful and that adds to the pleasure that you get from your property day after day. How Does an Electric Hedge Trimmer Help? Having the right electric trimmer is going to make this maintenance task a whole lot easier. Perhaps the main reason for this is that it is such a quick, painless way of carrying out the job. Switch it on, start cutting, and you will be done in next to no time. Another positive point is that there no real expertise needed to do this. You might want to check out this YouTube video on how to trim hedges, like the one below, but this is something that virtually anyone can do without any sense of fear. Are you reluctant to spend a lot of money on specialist tools that you rarely use? Thankfully, electric hedge trimmers are good value, as they tend not to cost much money and can give years of faithful service without much maintenance being needed. By using a quality trimmer from a reputable brand you will help to protect yourself from any injuries as you work. As well as these corded, electric models, there are also gas-powered alternatives and battery-run trimmers. Each of these types has a different list of pros and cons to look at. With corded models, the biggest advantage is that there is no limit on the amount of time that you can use them for. Even if you are working on a massive shrub or taking is slowly, you won’t run out of power at any time. You will be limited in terms of where you can go, but with the help of a long extension cord this shouldn’t be too big a problem for most people. Which Trimmer Is Right for You? You will soon realize that there are lots of different models of trimmer available right now. How will you know which one to choose? The following are a few of the different issues that you might want to consider in order to make a sensible decision. Do you have a really large hedge to deal with? If not, then many of the smaller, lighter models are designed especially for people who worry that they might not have the strength to use a large trimmer. A fairly long warranty is always a good thing with any electrical product. Since this is something you will use a few times a year, a 2 or 3 year warranty will guarantee that you get plenty of use out of it. Naturally, it should last a lot longer than this anyway. How easy is it to hold? If you are going to be cutting a large hedge then you will be holding your trimmer for a fairly long time. This can become uncomfortable after a while. Because of this, it is worth looking for a model that has a comfortable grip and a handle that can be adjusted when necessary. How far can it reach? 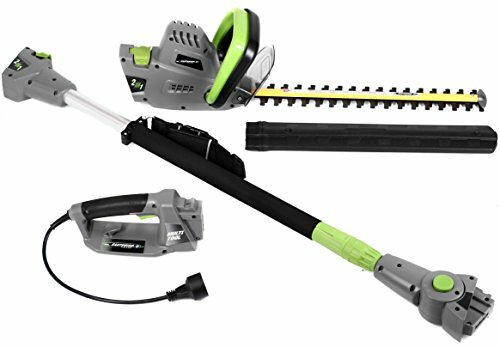 Would the best electric hedge trimmer for you be one that has an extremely long cable? This may be the case if your hedge is a long way from your nearest electrical outlet. Using an extension cord is an option but some people prefer to avoid this if possible. 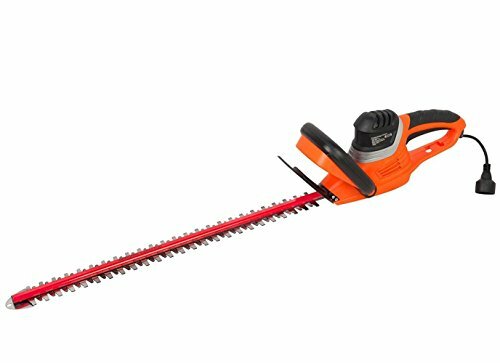 With this 18-inch Black & Decker hedge trimmer, you get a powerful machine that doesn’t produce high vibration levels while cutting. The manufacturer says that this is because they have used dual-action hardened Steel Black, which results in less vibrating than with their single-action tools. The power comes from a 3.5-amp motor, which allows the long blade to slice through branches of up to ¾ inches thick pretty comfortably. It is clear that this model has been put together with the type of person who doesn’t want to struggle with a huge, heavy machine in mind. This means that pretty much anyone can use it without any great strain or any danger, even if they have very little experience with hedge trimmers. A simple yet effective feature that has been added to it is the cord retention loop that allows you to avoid the risk of accidental unplugging while it is in use. A wrap-around handle also lets you hold the trimmer comfortably even on longer jobs. Driven by a 4.6-amp motor and with a ¾ inch cutting capacity but weighing just 8.5 pounds, this trimmer is light but powerful. The laser cut steel blade is dual-action and dual-edge. This means that you can use it to cut easily to either side. It also works without causing too much vibrating to tire out your hands and arms. The blade is 24 inches long and it has been built with rust-resistant hardened steel for a tough, durable finish. In terms of safety features, there is a two-hand safety switch as well a good-sized hand guard to keep you out of harm’s way while the blade is in operation. The comfort factor is increased by the use of a soft rubber grip. This is a good all-rounder from Garcare that cuts powerfully and is versatile while being light and easy to use at the same time. It probably suits you if you have a reasonably small yard that you want to keep looking good without exerting too much effort or spending too much time learning what to do. 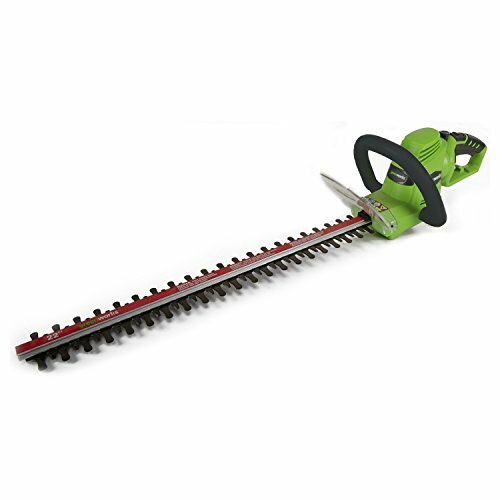 This model of electric hedge trimmer uses a 4 amp electric motor and has an 22-inch dual-action steel blade. This means that it can offer a very good 5/8 inch cutting capacity. Unless you have particularly tough hedges or shrubs, this should be enough to keep them neatly trimmed and under control. As is common with many of the best trimmers of this type, you can use it to cut to either side without any issues. This is another lightweight trimmer, as it weighs in at just over 5 pounds. So, you don’t need to worry about it being awkward or heavy to operate. The GreenWorks brand also promises that all of their products are produced with a zero carbon footprint, meaning that this is an option to take into account if you are concerned about helping the planet. Another interesting benefit here is that they offer an exceptionally long warranty of 4 years, for added peace of mind. The blade is laser-cut, meaning that it is sharp and precise. This is a reliable trimmer that should give you plenty of service without any problems. In this case, the weight of just 5 pounds makes it a good choice for anyone who is worried about perhaps not being able to handle a heavier trimmer. Despite it being so light is still packs a decent punch, with a 3.5-amp motor and large, 22” blades. It isn’t suitable for cutting particularly thick branches but makes light work of thinner ones. The stainless steel blades are pre-hardened and rust resistant. All this adds up to a good overall machine that does the job you expect from it with a minimum of fuss. When it comes to handling the device, a full wrap-around handle makes it easier for you to hold it without any sort of discomfort. 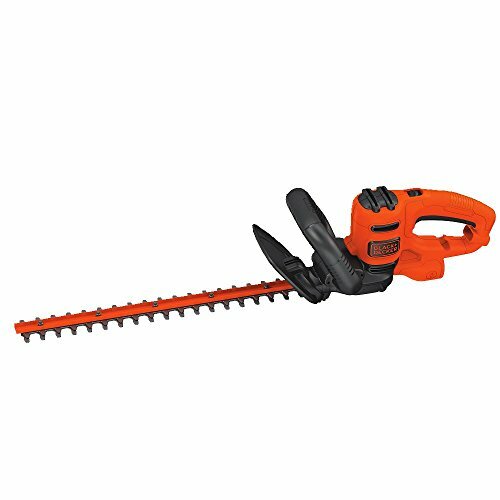 The fact that this Sun Joe hedge trimmer comes with a 2-year warranty also means that you won’t worry about it failing you in its early days. The two-handed safety switch is a good safety feature that means that accidental start-ups should be avoided too. The trimmer starts up with the push of a button and like all of the best electric hedge trimmers, it is virtually maintenance-free. 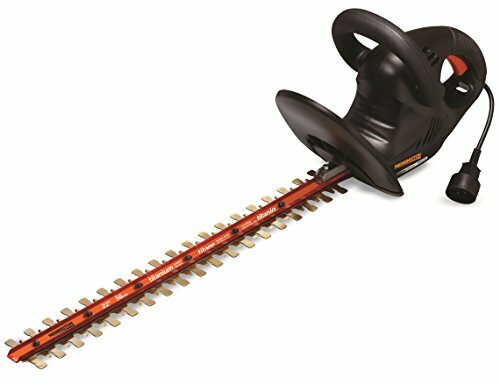 You get a choice of six cutting angles thanks to the rotating adjustable pole cutting head on this Earthwise hedge trimmer. In fact, it is classed as a two-in-one tool because you can use it as a standard hedge trimmer or else add the pole to it for a longer reach. This second option is incredibly useful if you need to cut the top of a tall hedge, as it allows you to do this without having to mess around with a ladder or balance dangerously on your tiptoes. It can also be used to cut down low without causing you any strain. For safety purposes, you get a protective blade cover and shoulder support strap. The pole gives you 8 feet 8 inches from the handle to the edge of the blade. The cutting blade is 18 inches and it gives you a cutting capacity of 11/16 inches. This versatile tool weighs 6 pounds and can be converted from a pole trimmer to a conventional hedge trimmer with the push of a button. With this Remington hedge trimmer, you get a well-balanced device that makes clean cuts without too much vibrating. It runs off a 4.5-amp electric motor and has a pair of 22-inch dual-action blades that are covered in titanium. In this way, it can handle branches that are up to ¾ inch thick. It is a durable-looking tool and comes with a 2-year limited warranty to back it up. The cushioned grip makes it more comfortable to use and the storage scabbard is a nice touch that allows you to store it away neatly and safely after each use. It weighs 10 pounds and the dimensions are 9 1/2 x 12 x 37 5/16 inches. It is described by the manufacturer as being light; however, at around 10 pounds it is a bit heavier than many rival trimmers and might be too heavy for some people’s liking. Having said that, if you like the feel of a heavier tool then you might prefer the extra weight that this device offers. Probably a bit too heavy got a lot of people to feel comfortable using it. This selection of electric hedge trimmers shows us that there are some crucial differences between all of these different models. While they are all designed to do the same basic job, the variety of features, weights and power means that it is worth taking some time to see which one best meets your needs. 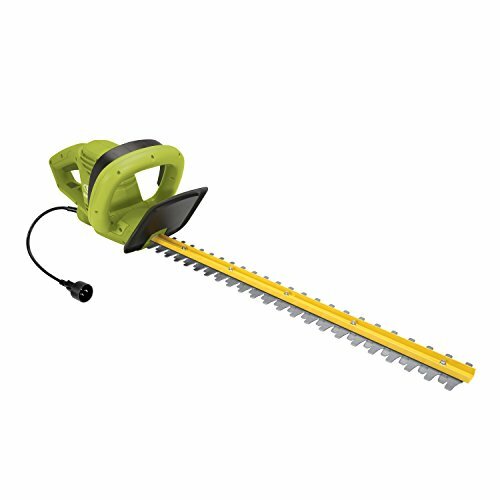 In our opinion, the best electric hedge trimmer around just now is the GreenWorks model. It does the basics as well as any of the others, as it is a light, comfortable, and safe device to use. In addition, the long warranty and the company’s zero carbon policy really help it to stand out from the crowd.